Once Upon a Time, there wasn’t a little squirrel. When developing the various projects for Lavender Honey & Other Little Things, nestled snuggly on the list of ideas was a squirrel, but he didn’t make the final cut. 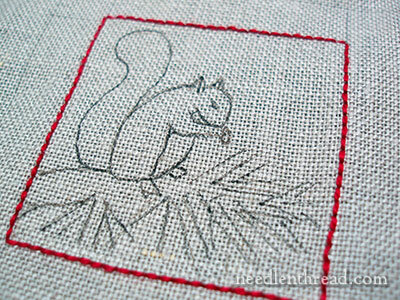 This wee Squirrel that Wasn’t – let’s call him Stitchy the Squirrel – began as a sketch within an outline of red backstitch on linen. Because he was so small – his fairy godmother squeezed him into a two inch square outline, making him a small squirrel indeed – he wasn’t very detailed. But he never held it against his fairy godmother that she concocted a body for him that looked more like a penguin’s body. His fairy godmother gave him a pine needle wreath and hung within it a fat, tasty acorn. She then began to decorate his perch and add a little color to his life. Using regular DMC stranded cotton, his fairy godmother worked up a lush branch of greenery for him to stand on. She used stem stitch for the branch, adding evergreen sprigs in dark green and light green with a combination of stem stitch, straight stitch, and fly stitch. Then, because winter was coming on, she began to give Stitchy a nice, warm, woolen coat, which was made with Fine d’Aubusson wool threads in long and short stitch. And so that Stitchy could see well when foraging for nuts and other good things to eat, his fairy godmother bestowed upon him a gargantuan eye, using a granito in dark brown wool. Stitchy never really forgave her they eye. He felt it made him look rather ridiculous. To make up for the ridiculous eye and to give him something to be proud of, Stitchy’s fairy godmother bestowed upon him the most luxurious of squirrel tails, using several strands of DMC floss in different colors of brown to create this Turkey work masterpiece. Stitchy was in a panic when he saw that tail go in! What was his fairy godmother thinking?? She always seemed so level headed, but he feared the worst. She had gone… nuts. Eventually, Stitchy’s tail was trimmed, but it was too late. All of his weight was in his tail end, and he was feeling pretty unbalanced and miserable. Though his fairy godmother had all the right intentions and wanted him to live happily ever after with his sumptuous tail, poor Stitchy was put on hold and nestled away within a box, to wait. He’s been scratching around in there. He wants to get out. I think he just might…. I, for one, would love to see Stitchy come to life. I think he’s a cutie pie, and I love the little acorn motif too. LOL! I think the eye is the whole battle. A lot of other things can be forgiven if that is right. When I read the last BATB class brochure, I noticed that Jenny McWhinney always starts with the eyes. It took me a while to see why, but now I think I get it. I’d love to see Stitchy fixed up too! 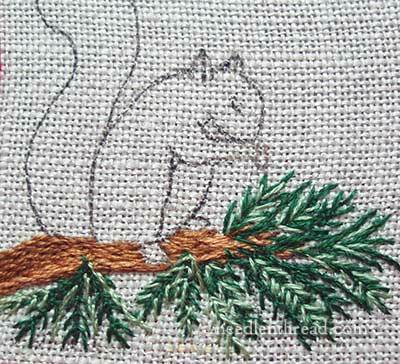 Stitchy the Squirrel is so sweet especially the bushy tail and the acorn I love it, I would love to add this to my Lavender, Honey and other little things. please let stitchy out he would love to rome outside and taste that scrumptious acorn and please give us the pattern so we can let him rome outside. 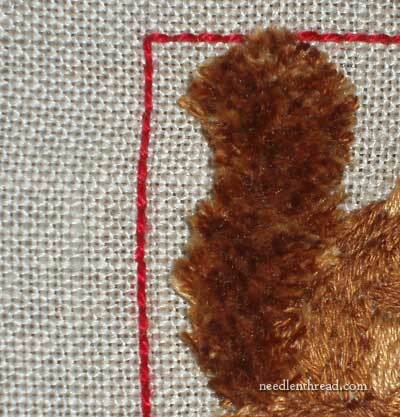 Poor neglected Stitchy – there’s something rather Christmassy about him and his nut wreath, with the red and green. I hope Fairy Godmother provides a happy ending to this furry tail. Oh no – poor Stitchy! I think his tail looks terrific – although I see his point about the eye. I have to say if the poor chap’s been shut away in a box for ages and wanting to get out, I think is fairy god mother might have to re-name herself the Wicked Witch of the West! I love Stitchy and look forward the the next chapter. He is so cute please bring him out to play. Thanks Mary this really gave me a giggle at the start of what is going to be a very stressful couple of days. When things get tough I’m going to remember Stitchy and smile. I love his tail and he’s nice and fat as he should be in the fall when the acorns come out. But don’t acorns grow onoak trees? They do grow on oak trees! But this particular squirrel likes to hoard them and eat them in pine trees, for some reason. It’s probably a seasonal thing…. Oh, Mary – you had me laughing out loud! I love not only your exquisite embroidery talents, but your lovely sense of humor is a delight. Thank you for brightening our days. 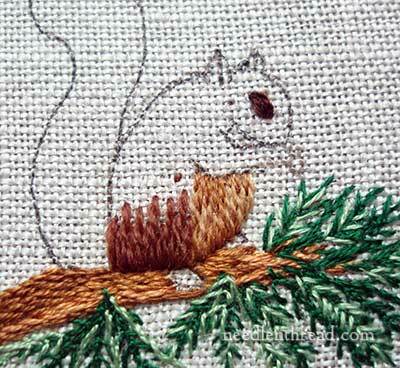 And please, do not let this squirrel go unfinished, I adore him – his tail is awesome! Hahahahaha!!! Love the post! Looking forward to seeing Stitchy again! Poor little Stitchy. He doesn’t realize that he has a magnificent tail. His body fur is a bit mangy looking though. Perhaps he needs to shed it and grow in some finer fur so his lovely tail shows off even more like his cousins. I’m hoping his eye injury (he does look likes he’s been punched in the eye by the local crow) heals up. You may need to do a bit of surgery on that to reduce the swelling and restore his normal little bright eyed look. Please rescue Stitchy before winter sets in and he snuggles down out of sight. 🙂 good laugh for me! He has potential, for sure. I think Stitchy deserves to join the wider world – he’s cute! (Well, except for the eye.) And he’d make a great Christmas ornament….. I love your story and can’t wait to see Stitchy !! Hope we get to add him to the little projects! I’m pretty sure children would feel so happy listening the Stichy’s story tale, and I enjoyed too and you made me smile. Maybe one day you can make an embroidered book for children. You have a good imagination Mary. Many thanks Mary for this lovely and funny story. This squirrel have to live. Oh,I do hope you bring Stitchy out. I would love to stitch him! Love your site and looking at the beautiful work you do. Okay, Stitchy, time to break out of your “shell” and make a run for it! We Want Stitchy! We Want Stitchy! Oh, poor Stitchy! Please let him out of the box! I agree with the readers who want more Stitchy. This would make a terrific workshop for Grannies of young children. 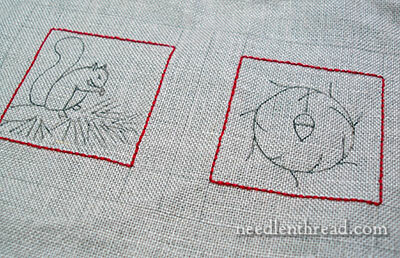 A workshop where they embroider a blanket or construct a book is just the ideal embroidery setting for Stitchy. Maybe a patchwork quilt for a child. Keep working on Stitchy!!! Just before I read about Stitchy today, I had been reading the Somali Cat Club website where until yesterday there were 4 Somali cats looking for a new home. Now there is just one, Olly. He is the oldest and he has been looking for a home for the longest time – since the beginning of this year. So, please, let Stitchy come to life and perhaps there will be a happy ending for Olly as well. Oh no! we can’t have poor stitchy hiding away that magnificent tail! Bring him out in all his splendour! Mary your ongoing inspiration is amazing thank you. I am waiting excitedly to see what else is going to come out of this box of Stitchy’s, after all he cant be alone in the forrest of pines, Can he? Oh, I do hope he comes to life. I would like for his cousin to come and live at my house along with the accompanying acorn. Stitchy is adorable!!! This whole post was so cute 🙂 I think the Fairy Godmother should definitely finish him off. Also – I’d love to hear the tale of that cute little clownfish that was in your basket of smalls but didn’t make the book too! Charming story, and the squirrel really is very sweet. Surely you can make him blink and the eye won’t appear quite so big. As much as I like the fuzzy tail, I’m thinking squirrels have rather long, straight fur in their tails. I kinda like the picture before you made the tail fuzzy, with the long, loopy strands,perhaps hemmed in a bit to keep them in proportion. 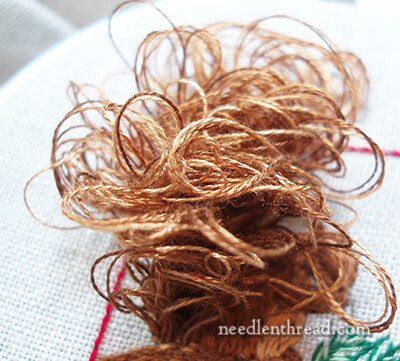 Frankly, you could stitch a naked mole rat and make it cute, you’re so talented. Oh! Bless him ! 🙂 Love him ! I’m with Aurelia – what did Fairy Godmother do to the clown fish? I hope that not making the final cut doesn’t mean that there won’t be a director’s cut (or fairy godmother’s cut). I’d love to see this wee chap make an appearance in his glory some time in the future. Perhaps in time for this autumn’s acorns. Bet you can camouflage that eye, fairy godmother. If you can’t who ever could? 🙂 Thanks for the smile at the end of a loooong work day! Stitchy just needs to grow into that tail and eye. He’s simply at the awkward pre-teen/teen years when all the parts sometimes just dont’ quite work together yet. He’ll be quite handsome when he’s all grown up. LOL!! Let him out, let him out! Perhaps something in the other corner will balance him? This is a message from Stitchy, which for some odd reason came to me, in Australia where there are no indigenous squirrels. I don’t mind the tail now, really I don’t, but I think the FG might benefit from some rodent anatomy lessons. Where are my nice rounded thighs? She said I looked more like a penguin and she was right, I do. At least I can see the acorns out of that eye (the one on the other side is the same, and they both work OK), but how I would love my upper thighs back. At the moment I can’t jump or climb or do any other squirrelly things …. please help. I don’t want to hurt FG’s feelings at all. So Mary, there you have it. All SS needs or wants is a bit of muscle around his upper leg and he will be the happiest little squirrel in the woods. Ah Mary C. your just to hard on yourself. You still rock!! Looking at the drawing on the fabric, I’d say, take that eye out and give him back that eyelash-line. He looks much cuter with half-closed eyes, enyoing his acorn. Please let stitch out! Hes too cute to be hidden away. Previous Previous post: Overdyed Thread Give-Away – Winner Announced!